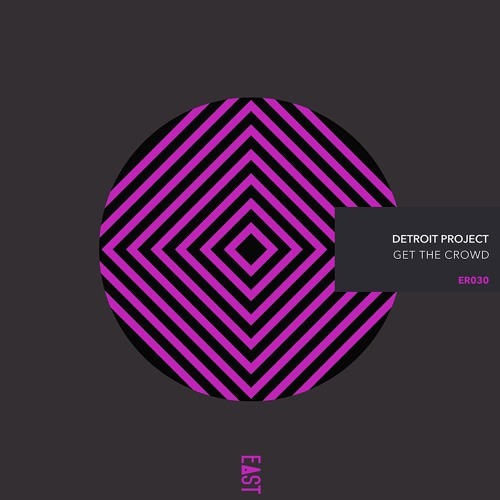 East Recordings welcomes back Manchester-based duo Detroit Project with their stripped-back 4-track EP ‘Get the Crowd’ set to do damage on the more tech-minded dance floors this summer. Detroit Project’s first release on East Recordings, ‘On the Dance Floor’, gave us a flavour of the guy’s sound: minimal, groove-based tech with lots of organic layers and repetitive hooks. Since then they have been busy releasing on labels like Absolutely Records, Sweep The Floor and Klaphouse Records, but it was their track ‘Dangerous’ on Enzo Siffredi’s label Wired that really put Detroit Project on the map and gave them their first top-twenty. ‘Get the Crowd’ kicks the EP off with a driving sub pulsating under a simple repetitive hook and a G-house spoken word vocal topline providing the release with its most peak time cut. ‘Niles’ takes things towards the early hours of the morning with a dirty lead playing off against tech stabs and a simple beat. But then the tribal beat and organ hook of ‘Diamonds’ provides the EP with its most up-lifting moment. Whereas ‘When it Rains’ takes us straight back to the dance floor with its twisted lead and bouncing sub sure to be in clue-in DJs’ sets this summer. For fans of tech-house and stripped back house.